Homophobia is still rife across the EU. Not just through individual attitudes, but through governmental action. 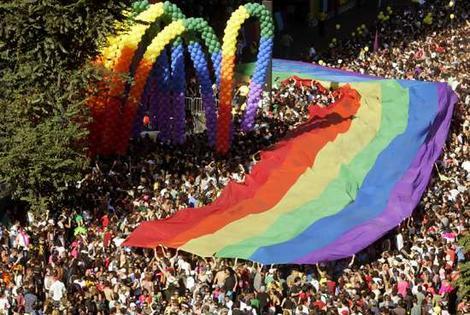 A court in Lithuania initially banned this years gay pride event in Vilnius before this decision was overturned. The event however, was limited to about 500 participants as over 1000 would be marchers were forcibly held away by riot police who fired tear gas at them. Police with dogs and horseback ringed the entire event. A Catholic Mass at the nearby national cathedral was held to pray for homosexuals. “Sweden has already wiped out traditional families. Now they came over here to tell us how to live, how to think and who to sleep with. Lithuania will not allow such perversions,” said Jonas Kempinskas, who walked from the Cathedral to the protest holding a huge cross. The Swedish Minister for European Affairs Birgitta Ohlsson attended the march. She was the highest profile foreign attendee but 5 members of the European Parliament also attended it. A handful of British diplomats made an appearance. At the time of writing at least 12 people have been arrested. I do not hold out much hope for them being treated well in custody.